Deep autumn is my favorite time of year for walking in Tsukuba. Both overhead and at my feet, the yellows, reds, oranges and browns of the gingkos, maples, sweet-gums, oak, horse chestnut and zelkova. Cool, invigorarting breezes bring the smell of decaying plant-matter to my nostrils, uncannily activating the parts of my brain that are connected with memory and contemplation, while my feet are cushioned from the concrete by a thick carpet of unswept fallen-leaves, as soft and fragrant as the humus on the forest floor. The area beween the sidewalk and the tree-tops is bursting with color as well – with bushes and hedges of camelia sazanqua running along most roads and property-boudaries abound with red, pink or white blossoms. Kidachi daria or ko-tei dalia near the entrance to the Namiki Public Hall in Tsukuba. Dahlia imperialis in Karima. You wont find these impressive flowers in parks or along the major thoughfares- but if you take a walk or bike-ride through Tsukuba`s older neighborhoods, you`re bound to come across them. Plenty to keep the eye (and nose) occupied. But even with all this autumn distraction, the casual autumn stroller in Tsukuba is sometimes stopped in his or her tracks by a less familar plant. Its flowers bloom well overhead, sometimes even higher than the eaves of the homes of the gardens they are planted in. 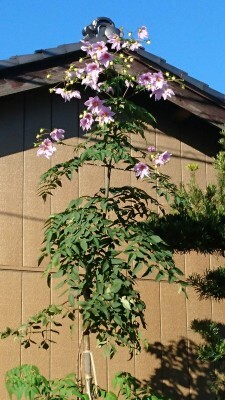 The flowers appear in November, and look like purplish-pink stars about 6 inches across. Staring up at them against the background of a pure blue autumn sky is impressive – you could say the same feeling that you have looking up at sunflowers in summer. Against the blue sky, Dahlia imperialis is native to Central and South America. 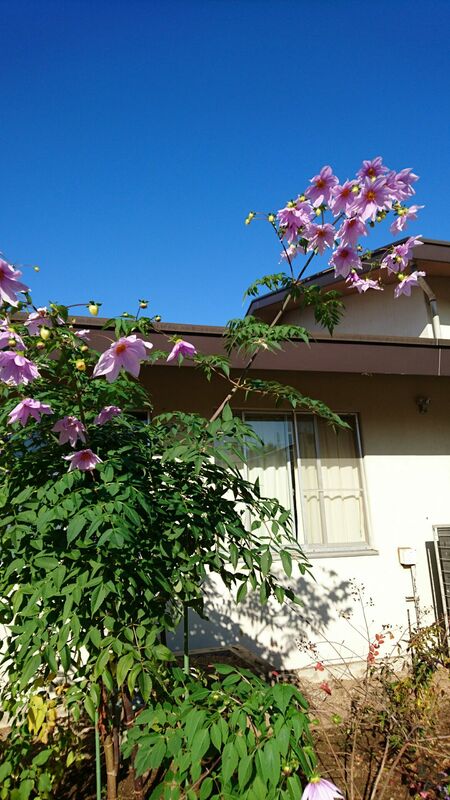 Since this plant does not have a long history in Japan, most people who stop to admire it, don`t know what it is. The fact that its stems, upon close examination, look like bamboo (and grows just about as fast as it, too) make things more confusing. 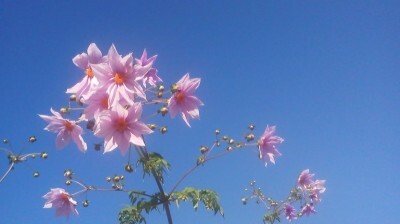 Everyone is surprised to hear that these plants are DAHLIAS – though it seems there is, in fact no one set name for them. 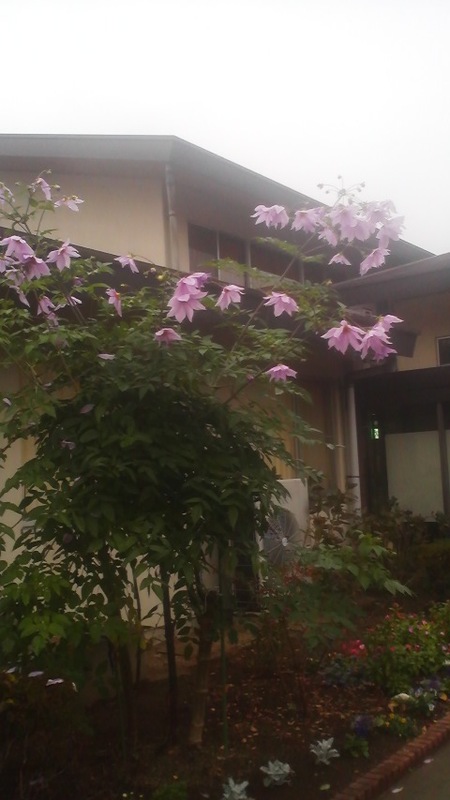 In English, you can called them Dahlia imperialis, imperial dahlias, tree dahlias. 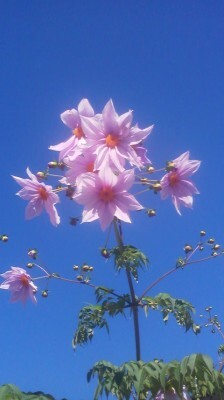 or bell-tree dahlias. In Japanese they are referred to as ko-tei daria or kidachi daria. They stay in bloom until the first frosts set in. Enjoy them while they last – and now you can tell your friends what they are ! I noticed that many people stop and admire these dahlia imperialis In front of the Namiki Public Hall – but no one knew what they were – even the botanically-savvy. In Karima, Tsukuba. KO-TEI DARIA or KIDACHI DARIA grow rapidly in late autumn. Their stems resemble bamboo – there is no relation. They apparently do not grow well in areas lit up at night.